The OCA 15EC is the entry level measuring device for professional contact angle measurements and drop shape analysis. The sample table of the OCA 15EC can slide freely in X- and Y-direction and is locked into position with its switchable magnetic base. 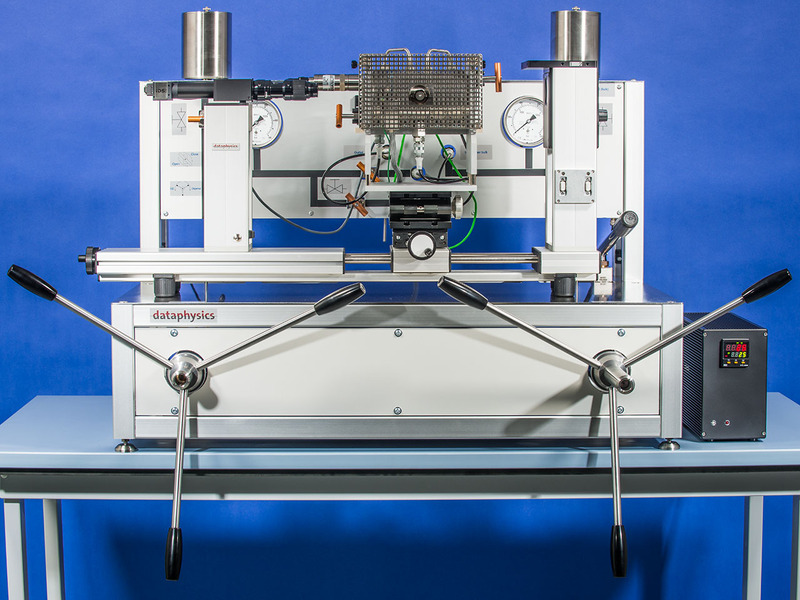 In Z-direction the sample table is adjustable using precision mechanics with a hand wheel. The fast 6-fold zoom lens with manual focus and adjustable observation angle in combination with the USB camera ensures pin-sharp drop images and facilitates the effortless analysis with the SCA software. With a single direct dosing system SD-DM or a double direct dosing system DD-DM liquids can be positioned and dosed with one or two electronic syringe modules ESr-N, respectively. Direct tubeless dosing of the syringe content and the ability to use cost-saving disposable syringes and needles allow for short preparation times and minimal cleaning efforts. Even though the OCA 15EC is a high precision measuring device designed for laboratory use, it is highly mobile and can effortlessly be taken apart with two star grip screws and be stored securely in a transport case. 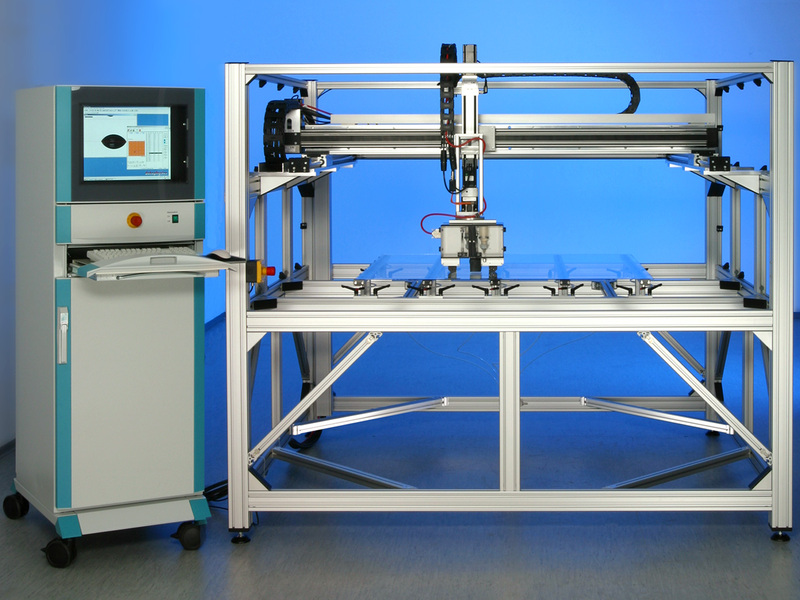 For a fast and convenient access to the surface and interfacial measurements two pre-configured packages are available. These include all necessary components to get started immediately. The OCA 15EC Package 1 consists of the base unit, a single direct dosing system SD-DM, one electronic syringe unit ESr-N and the software module SCA 20. The OCA 15EC Package 2 consists of the base unit, a double direct dosing system DD-DM, two electronic syringe units ESr-N and the software module SCA 20. Single direct dosing system, SD-DM, for use with standard and disposable syringes and needles. The OCA 15LJ is a special variant of the OCA 15EC that is designed to support the DataPhysics Instruments Liquid Jet systems like the Double Liquid Jet system DLJ. With the high-performance camera with USB 3.0 interface and its higher resolution multiple drops fit into the frame and can be analysed simultaneously. The additional connecting sockets for accessories/extensions on the side of the illumination housing enable a mounting of up to four syringe modules. 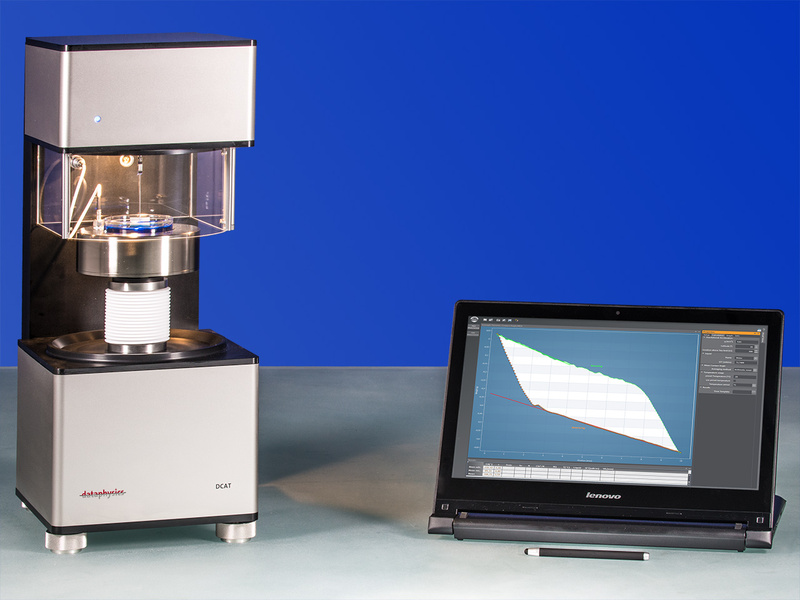 Hence, multiple drops can be simultaneously dosed and analysed for a surface energy determination in one-click. 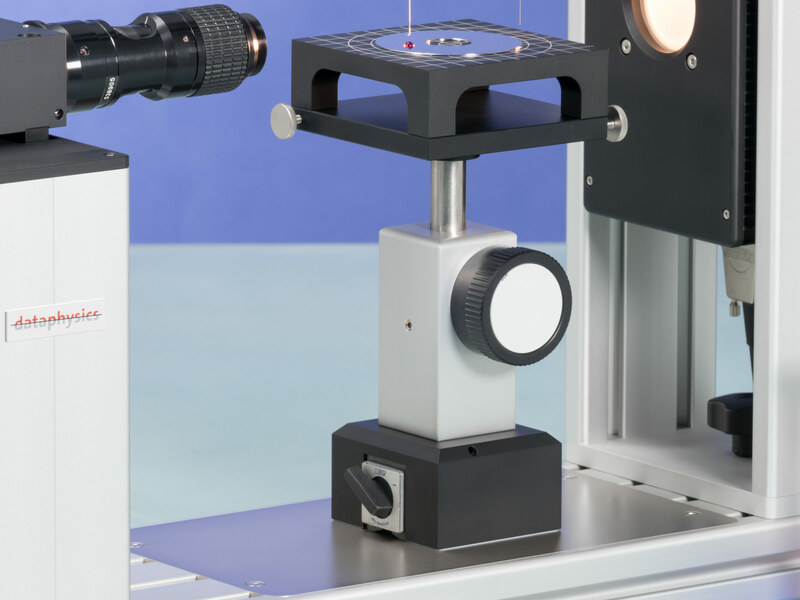 The OCA 25 is the all-purpose measuring device for contact angle measurements and drop shape analysis. The sample table of the OCA 25 is adjustable along all three directions in space via precision axes with hand wheels. Hence, a fast and exact manual positioning of the sample is always guaranteed, even when using high-performance temperature chambers like the electrical temperature control unit TEC 700. Analysis of even the fastest processes is possible recording up to 2450 frames/s using the 6-fold zoom lens and the high-performance camera with USB 3.0 interface. Hence, contact angles on adsorbing surfaces like tissues or powders can be measured reliably. 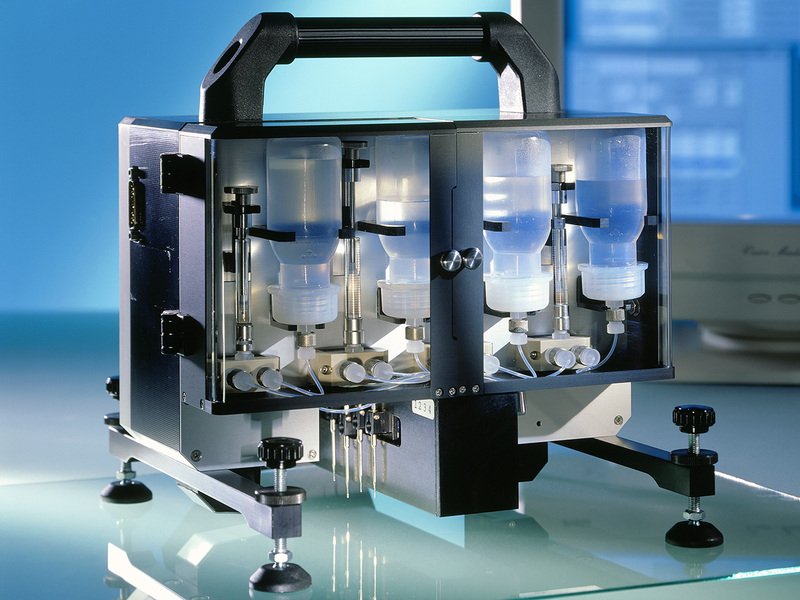 For dosing liquids the manual single and double direct dosing systems SD-DM and DD-DM can be used as well as the electronic multiple direct dosing systems DDE/x. The latter are able to electronically position one to four electronic syringe modules ESr-N. 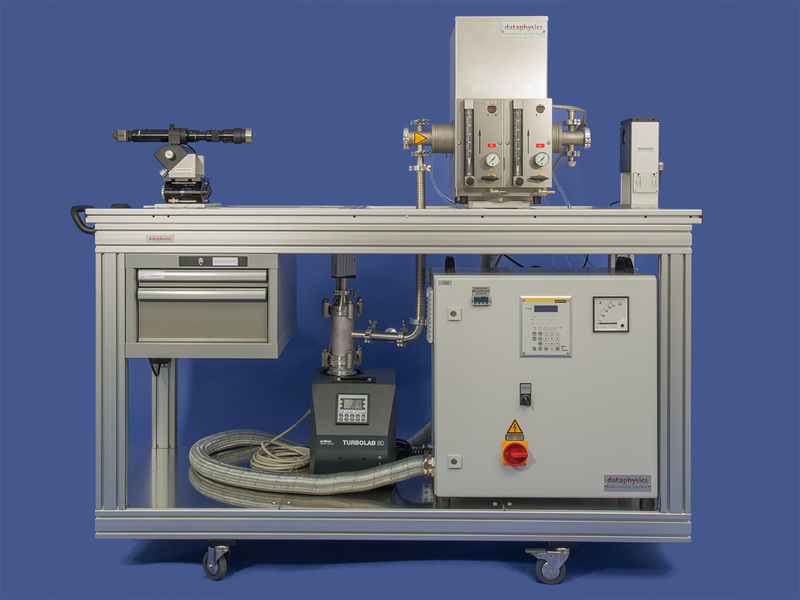 Furthermore, a nanolitre dosing system can be used to generate extra small liquid drops. Even these are no challenge for the OCA 25 due to its high resolution optics. 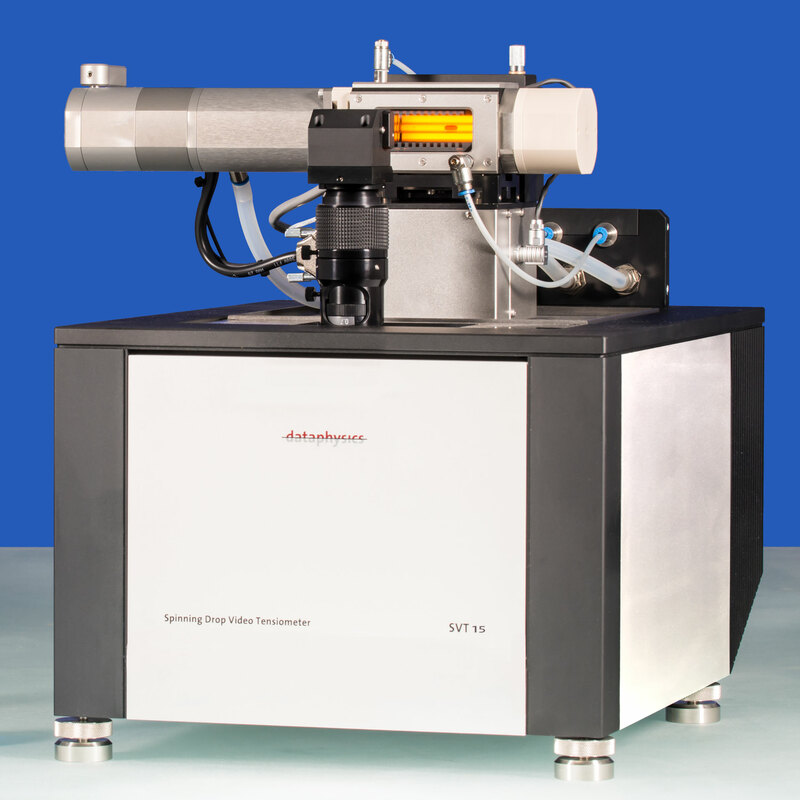 The OCA 25-PMC 750 with its high pressure measuring chamber provides the opportunity to measure interfacial tensions and contact angles at pressures of up to 750 bar and under high temperature conditions of up to 200C. The high temperature measuring system OCA 25-HTV 1800 is capable of measuring contact angles at high temperatures of up to 1800 C and under vacuum down to 10-5 mbar or under inert gas atmosphere, respectively. 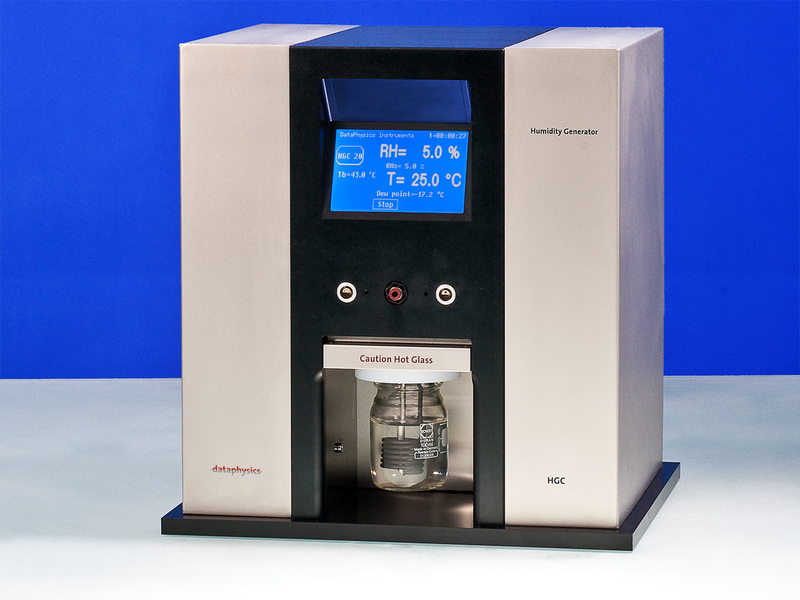 OCA 50 The OCA 50 is the fully automatic measuring device for the time-saving analysis of the wettability of solid surfaces and the determination of the surface energy of solids. 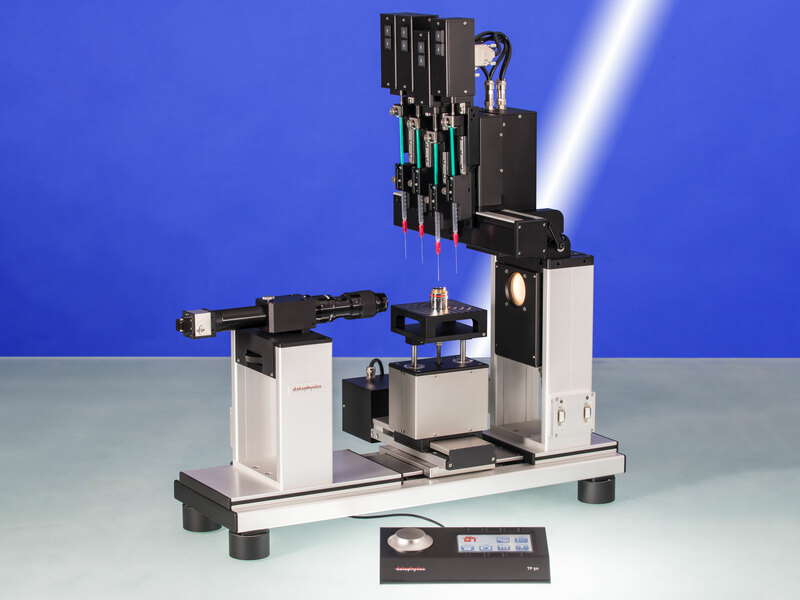 The sample table of the OCA 50 can be positioned along all three directions in space via electronic high-performance axes, with both extraordinary speed and highest precision. 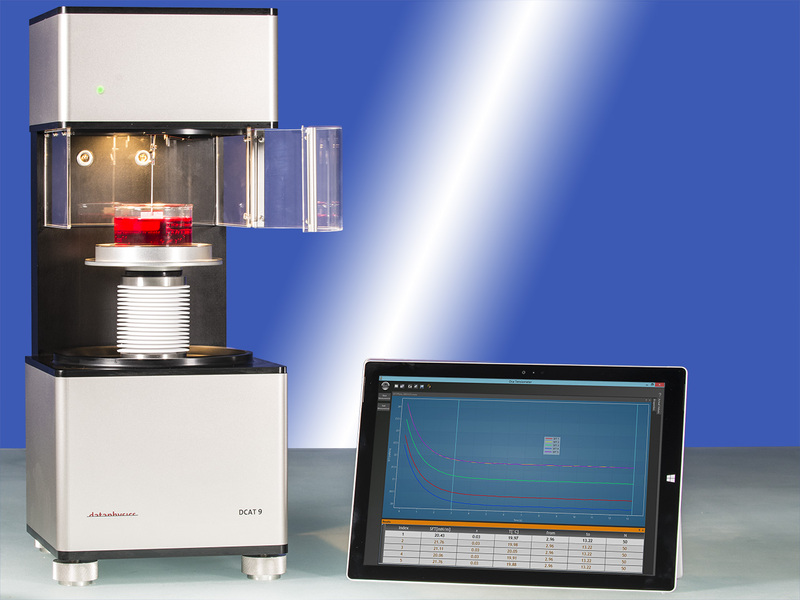 Combined with an electronic multiple direct dosing system DDE/x and up to four electronic syringe modules ESr-N the determination of surface parameters can be automated completely. The automation of measurements succeeds easier than ever before thanks to the intuitive automation dialogue of the SCA software and its visual drop positioning system. 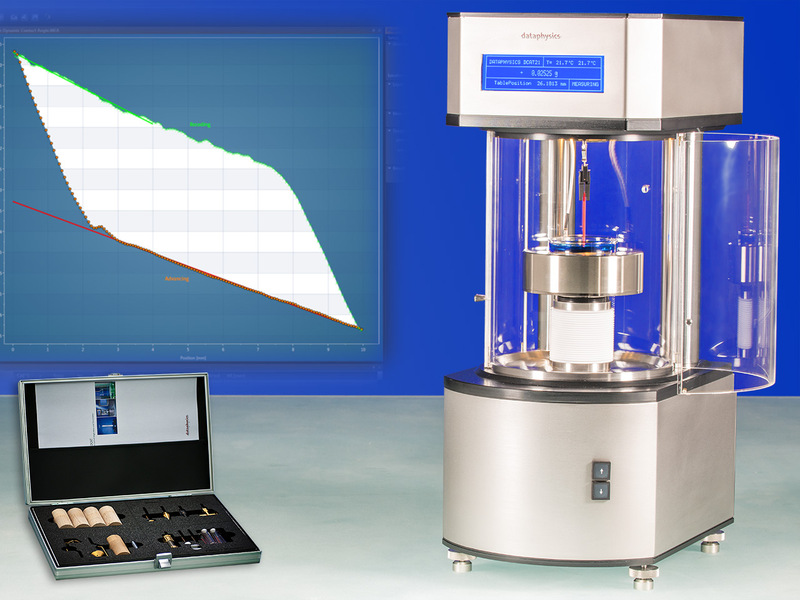 Hence it is possible to determine, for example, the surface energy with four test liquids at different position of even large samples without any manual user intervention. This facilitates a complete and automated sample mapping. In order to map silicon wafers, electronic turn tables with vacuum fixation are available. They allow to access any position for contact angle measurements, even on 12 wafers. In any case, the 6-fold zoom lens and the high-performance camera with USB 3.0 interface ensure optimal images of the deposited drops. For a fast and intuitive device control, even during complex measurements, the TP 50 control panel with touch screen and precision control wheel is included with every OCA 50. 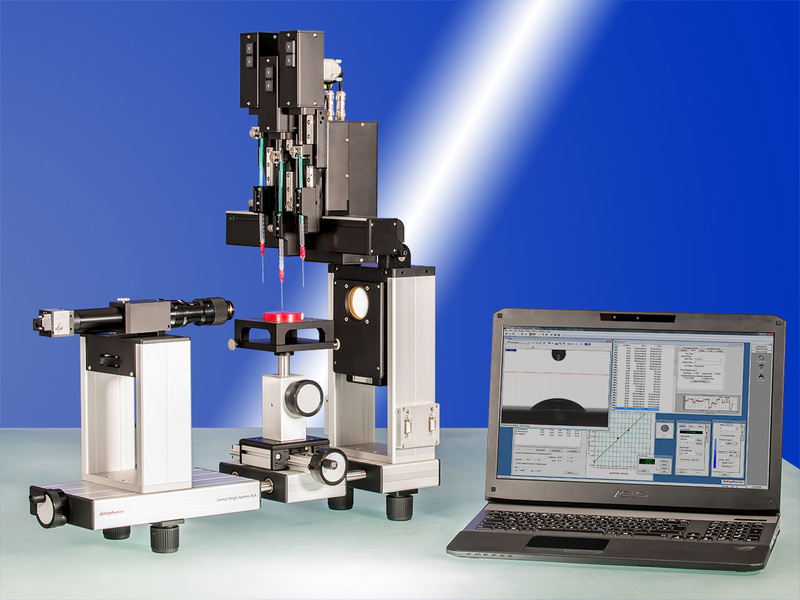 The OCA 200 is the contact angle measuring and drop contour analysis system for microscopic and macroscopic structures. The software-controlled, electrically driven optic alignment enables the OCA 200 to adjust the observation angle and to focus automatically. With the trendsetting 10-fold zoom lens and the reliable auto focus system by DataPhysics Instruments, the OCA 200 is equipped to handle any kind of sample size from a macroscopic silicon wafer to the microscopic mesh structure of a coronary stent. In combination with the high-performance camera with USB 3.0 interface even smallest drops of highly volatile liquids can be monitored. 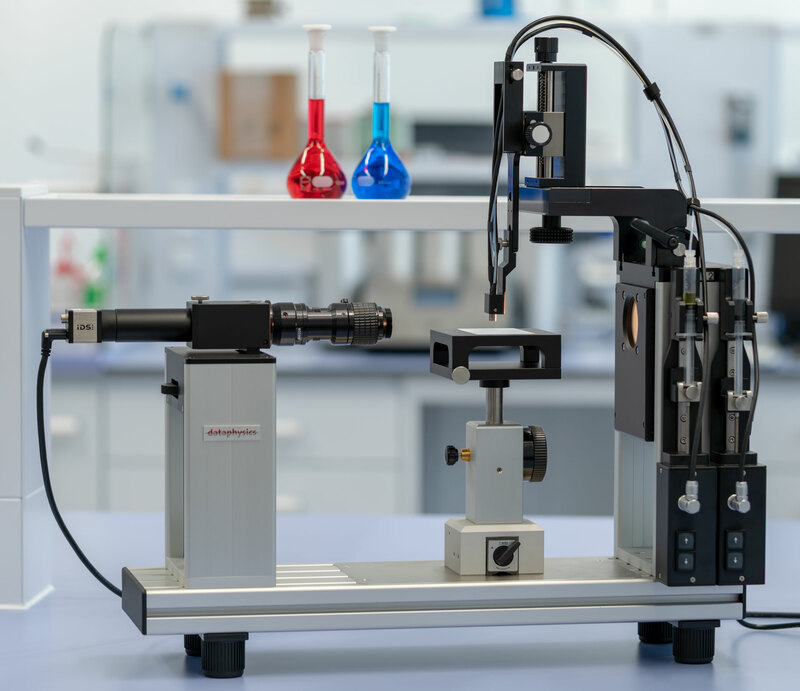 The electrically driven sample table makes it possible to position micro-structured samples with highest precision and exceptional speed for fast automated measuring procedures. With an electronic multiple direct dosing system DDE/x and up to four electronic syringe modules ESr-N liquids can be deposited on a macroscopic sample and its surface parameters can be determined automatically. For the analysis of micro-structured samples the nanolitre dosing system is available which can generate down to 10 nanolitre small droplets. These droplets are small enough to fit, for example, between the screw threads of a dental implant whose surface is to be analysed. Even smaller structures can be analysed using the picolitre dosing system PDDS which can dose down to 30 picolitre small droplets. These allow contact angle measurement, for example, on the individual wires of the mesh structure of a coronary stent or on single fibres. 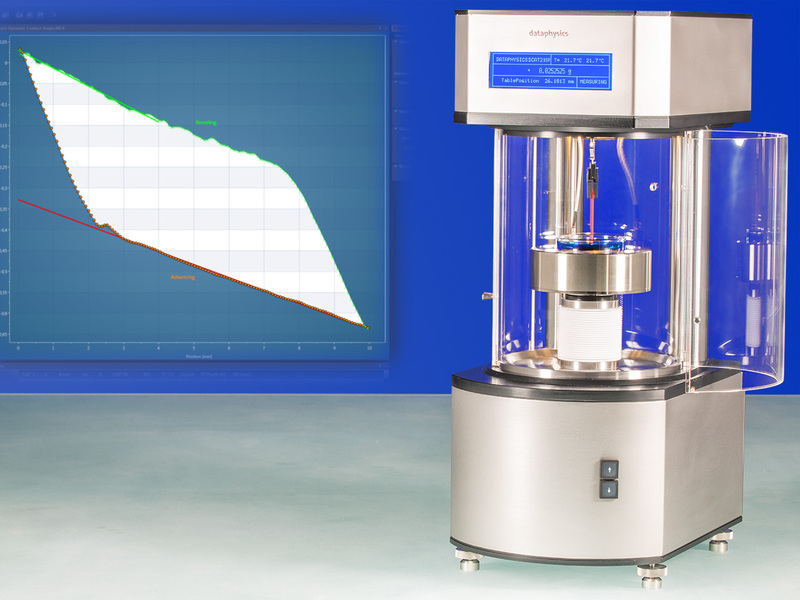 The DCAT 9 is the powerful entry level model for the weight-based measurement of surface and interfacial tension and the density of liquids and solids. In order to measure temperature dependent properties the DCAT 9T features an integrated digital thermometer and a liquid temperature control unit TV 70. The DCAT 15 enables additional measuring methods and hence can be used to determine dynamic contact angles, the surface energy of solids or sedimentation and penetration properties. In addition the DCAT 15 can be extended with a liquid dosing unit LDU 25 and can thus create sequential concentration series of, for example, surfactant solutions. Without manual user intervention the critical micelle concentration (CMC) can be determined software controlled in a series of experiments. 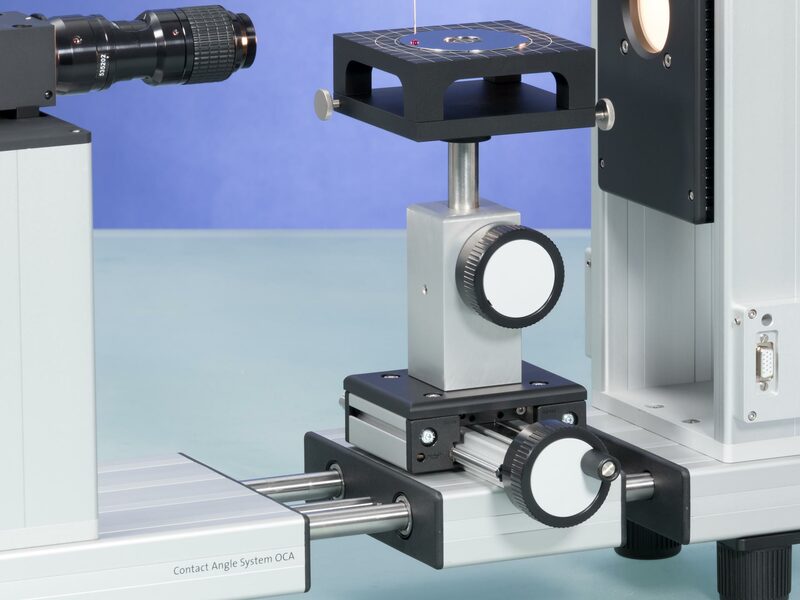 The dynamic contact angle measuring device and tensiometer DCAT 25 is the multifunctional all-round instrument of the DCAT series. 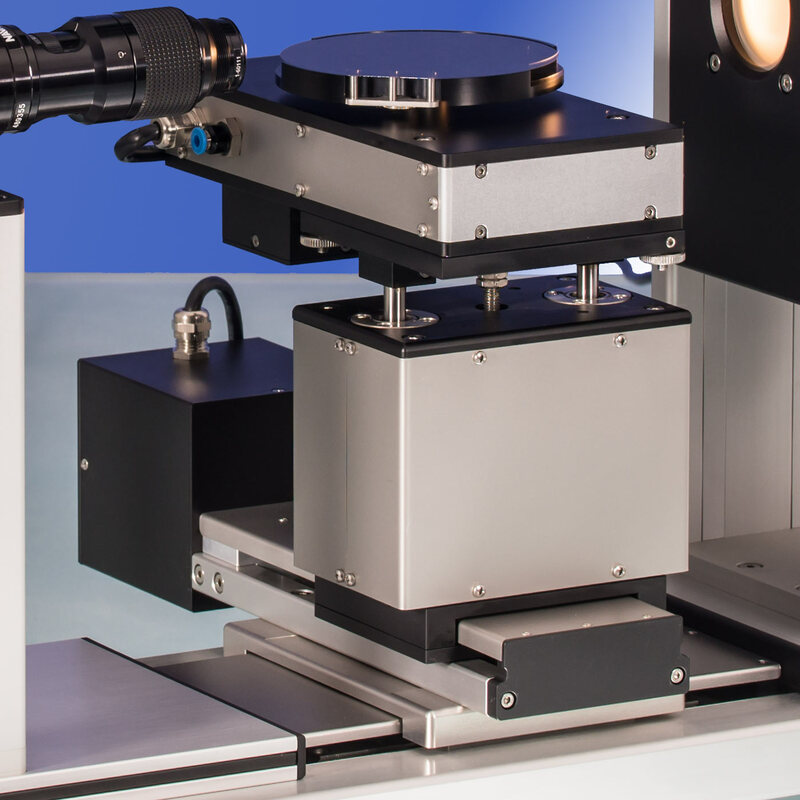 The weighing system is even more precise than that of the DCAT 9 and 15 and hence offers highest accuracy for the determination of surface and interfacial tension. 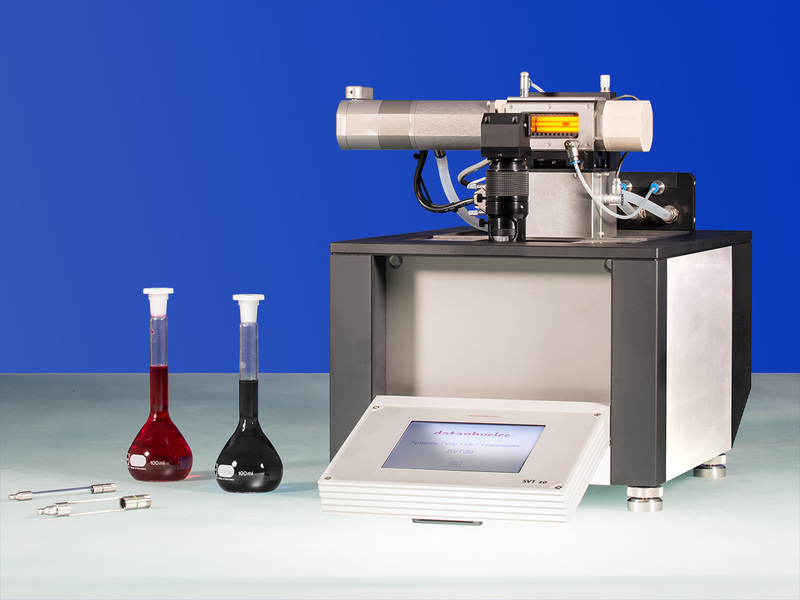 A completely closed sample chamber enables measurements under inert gas or ionised atmosphere as well as with controlled relative humidity. 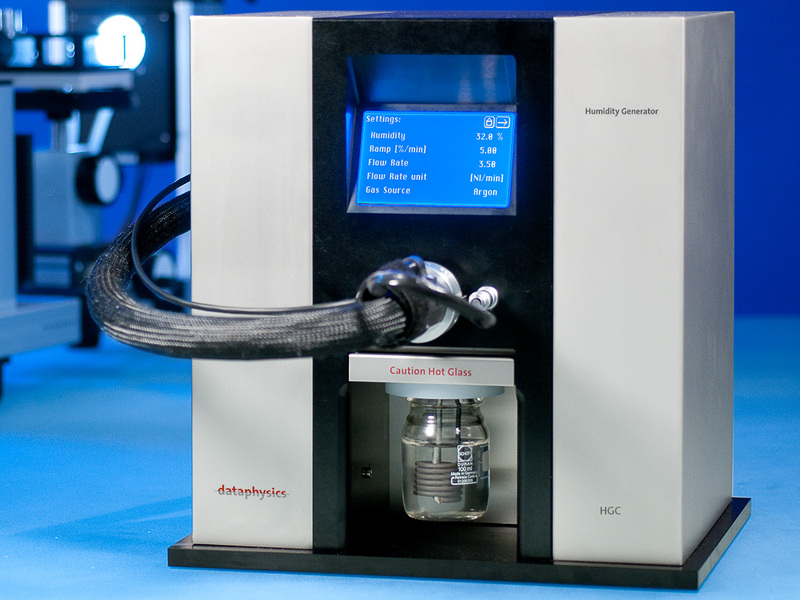 Due to the longer travel distance of the sample stage, an electrical temperature control unit can be mounted inside the DCAT 25 which makes measurements at temperatures of up to 250C possible. Moreover the Langmuir trough module can be used to investigate the surface pressure and the interfacial rheology of monolayers. 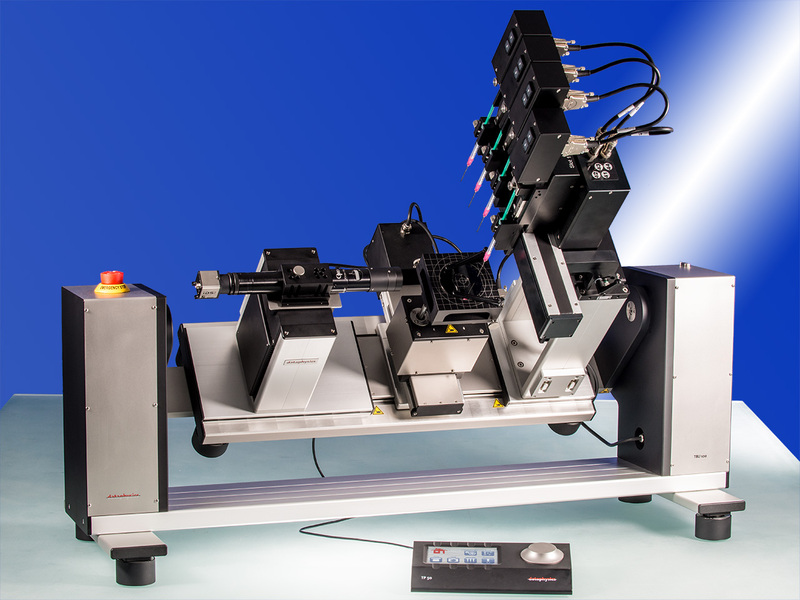 The upgrade video system provides the opportunity to record video-sequences during force of adhesion measurements and to evaluate contact angle, contact area etc. in addition to the force. For an intuitive and fast device control even during complex measurements, a TP 50 control panel is included in the delivery of every DCAT 25. The DCAT 25SF incorporates a weighing system of highest accuracy with a resolution of 0.1 ug which allows to measure even on single fibres. As an ideal single fibre tensiometer the DCAT 25SF is not limited to this very special purpose due to the modular design of the product line. Whether it be for large or small substrate areas, the PCA 100M is the ideal, handheld, portable instrument for controlling the qualities of coatings, examining the surface energies of pre-treated polymer films in the production process, or testing the qualities of cleaned or adhesion promoted glass surfaces, prior to the next processing stage. The compact design and the plug and play connectivity, to any notebook or on-site available PC, without the need for a special frame grabber, enables the measurement of surface properties almost everywhere ? including use in cleanrooms (US FED STD 209E cleanroom standard class 10). High-performance telecentric lens with integrated aperture and adjustable observation angle. Video measuring system (max. 50 images/s sample rate). Software controlled continually adjustable back lighting, without hysteresis. Integrated multiple dosing system, with either two dosing needles (PCA 100M/2) or four dosing needles (PCA 100M/4), for software controlled automatic needle selection and positioning. Integrated automatic refill system with flushing and cleaning functions for dosing up to 5000 drops per filling and per liquid receptacle. 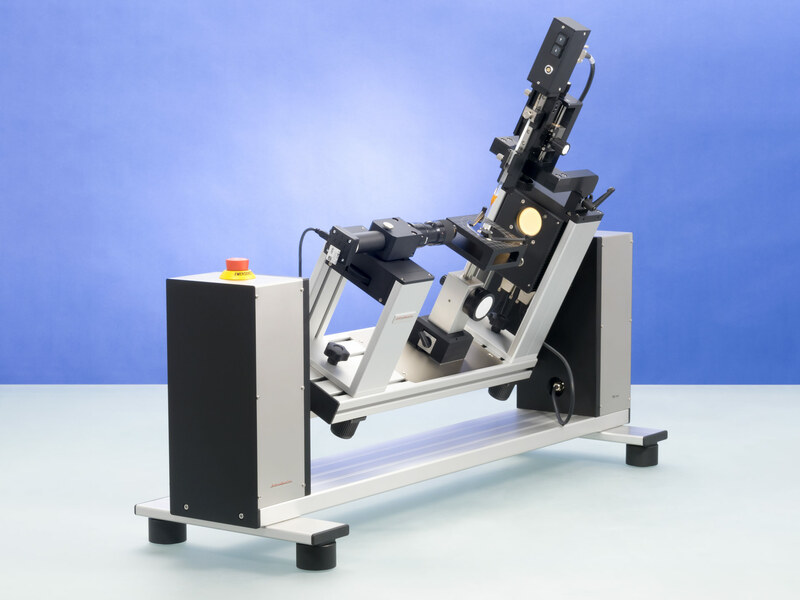 Robotically guided contact angle measuring instrument for process control. In combination with the single and multi axis cartesian robots of the RCC series, the PCA 100R contact angle measuring instrument is a specialised system for measuring wetting properties on substrates of very large surface areas, on site, during the production process. 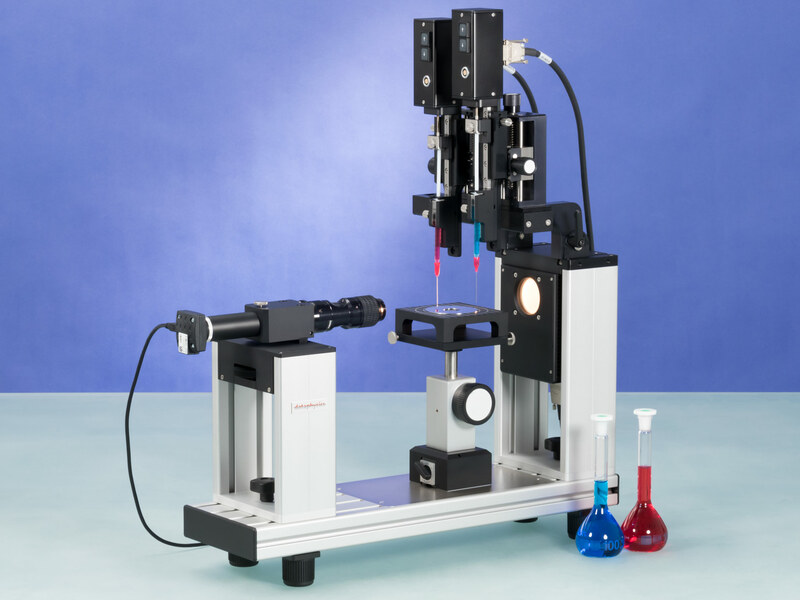 The fully automatic instrument enables the removes operator variability and other subjective factors and of the time necessary for the contact angle measurement. determination of the surface cleanliness of wafers and glass substrates for flat screens before the next manufacturing step. examining the surface energies of pre-treated polymer films in the production process. surface finishing and the cleaning of textiles. The PCA 100R and the robots of the RCC series are designed for the usage in cleanrooms according the US FED STD 209E cleanroom standard class 10.
measuring head with integrated optics, illumination and multiple dosing unit. video-based measuring system with high-resolution CCD camera and high-performance digitizing adapter. software controlled continuous adjustable intensity without hysteresis for a homogeneous back lighting. automatic needle selection and positioning. The SVT 15N is the entry-level spinning drop tensiometer, for measuring ultra-low interfacial tensions. With its precision drive capillaries can be rotated at up to 17000 rev/min. calculation of dispersive and polar con- tributions of liquids based on measured surface and interfacial tensions with surface and interfacial tensions with error limits. The humidity generator HGC 20 is designed for the automated regulation of the relative humidity of ambient clean air for a wide range of applications. It is easily connectable to many environmental chambers of DataPhysics and other suppliers.The ambient air first flows through the integrated desiccant reservoir. An electronic valve, controlled by the humidity and temperature sensor directly mounted in the measuring chamber diverts some air through the heated water reservoir before it flows through the heated connection tube. Automated drying and regeneration of desiccant by a built-in heating system in two alternatively used desiccant reservoirs (total stored desiccant amount about 1.0 kg). The humidity generator HGC 30 is designed for the automated regulation of the relative humidity of ambient clean air for a wide range of applications. It is easily connectable to many environmental chambers of DataPhysics and other suppliers. The ambient air or the external supplied gas first flows through the integrated desiccant reservoir. An electronic valve, controlled by the humidity and temperature sensor directly mounted in the measuring chamber diverts some air through the heated water reservoir before it flows through the heated connection tube. Stand alone generation of dry air/gas with and without an external pressurized gas supply. Additional external gas supply with integrated pressure regulator Integrated flow rate controller (calibrated for N2 and Ar).